Wikimedia Commons has media related to 1912. Italian forces became the first to use airships in war, as two dirigibles drop bombs on Turkish troops encamped at Janzur, from an altitude of 6,000 feet. Oreo cookies introduced in the United States. 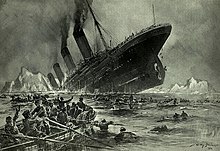 April 14–15 – Sinking of the RMS Titanic: RMS Titanic strikes an iceberg in the northern Atlantic Ocean and sinks with the loss of between 1,517 and 1,636 lives. The wreck would not be discovered until 1985. August 4 – United States occupation of Nicaragua: U.S. Marines land from the USS Annapolis in Nicaragua, to support the conservative government at its request. October 17 – Krupp engineers Benno Strauss and Eduard Maurer patent austenitic stainless steel. Edgar Rice Burroughs' character Tarzan first appears in Tarzan of the Apes, in American pulp magazine The All-Story. Sax Rohmer's character Fu Manchu first appears in the first story of The Mystery of Dr. Fu-Manchu in English pulp magazine Story-Teller. December 24 – Merck files patent applications in Germany for synthesis of the entactogenic drug MDMA (Ecstasy), developed by Anton Köllisch. Sylhet is reconstituted into the non-regulation Chief Commissioner's Province of Assam (Northeast Frontier Province). ^ Editor, Diane Toops, News and Trends. "Top 10 Food Brands of 2005". ^ Lord, Walter (1955). A Night to Remember. New York: Holt. ^ Zissa, Robert F. (July 1984). "Nicaragua, 1912". Leatherneck Magazine. Retrieved 2011-11-01. ^ "ThyssenKrupp Nirosta: History". Archived from the original on September 2, 2007. Retrieved August 13, 2007. ^ To the Cambridge Philosophical Society. "The Nobel Prize in Physics 1915". Nobel Foundation. Retrieved 2012-11-29. ^ Freudenmann, R. W.; Oxler, F.; Bernschneider-Reif, S. (2006). "The origin of MDMA (ecstasy) revisited: the true story reconstructed from the original documents" (PDF). Addiction. 101 (9): 1241–1245. doi:10.1111/j.1360-0443.2006.01511.x. PMID 16911722. This page was last edited on 22 April 2019, at 18:07 (UTC).